Our family narratives are full of fascinating stories of heroism, romance, joy, tragedy, and so much more. These dramatic tales become even more compelling when our ancestors’ lives overlap at unexpected moments, events, or places across generations. In my family, one such intersection occurred before and during World War I, in the deep waters of the Atlantic Ocean. Stanislaus Piotrowski, my paternal great-grandfather, immigrated to the United States aboard the liner S.S. President Grant, arriving at Ellis Island on April 15, 1909. Originally from Kolo in Russian Poland, Piotrowski lived briefly in Chicago before getting married and starting a family in Gary, Indiana. Here is a snip from his arrival record, showing his name, age, and occupation. Closeup of Stanislaw Pietrowski arrival record at New York, 15 April 1909. 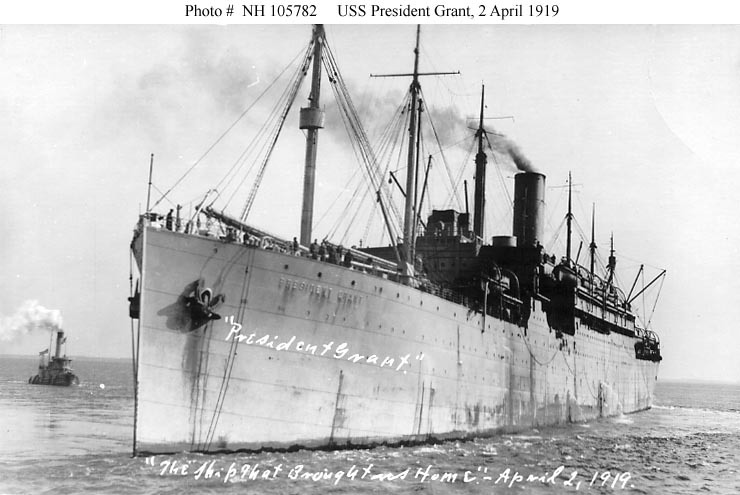 The President Grant was constructed in 1907 in Belfast, Ireland, and served the Hamburg-America Line for several years until the outbreak of the First World War in 1914. Here is a picture of the ship taken in 1919, courtesy of the U.S. Naval History and Heritage Command. The President Grant remained in New York until the United States entered the war, was then transferred to the U.S. Navy, and during the course of the war, ferried nearly 40,000 troops through the treacherous waters of the Atlantic Ocean and to the European battlefields. What a great story! The ship that carried one great-grandfather to the United States was in the same troop convoy that brought another great-grandfather back over to Europe to serve his country. I never anticipated that Piotrowski-Alderson would overlap as they did; indeed, nearly 50 years after the President Grant intersection, Stanislaus Piotrowski’s grandson would marry William Alderson’s granddaughter, linking the families together on the pedigree chart. As my research continues, I look forward to discovering new connections, remote or otherwise, in my family’s journeys through the generations. This entry was posted in Family Studies and tagged Alderson, Piotrowski, President Grant, World War I by krisrze. Bookmark the permalink. What an interesting story!! This is what good research produces. Yes, we are indeed! Sarah’s brother William is my g-g-grandfather. Perhaps we can share some info.